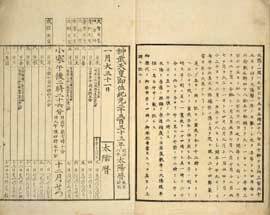 The solar calendar was brought to Japan during the Meiji Era. Image Courtesy of the National Diet Library. The solar calendar became the official calendar of Japan in 1872. Until then, the Japanese used the lunar calendar, which is based on the cycles of the moon. The lunar calendar was introduced from China, via the Korean Peninsula, in 604. This is why the solar calendar is often called the ‘new calendar’, and the lunar calendar is called the ‘old calendar’. Many traditional holidays in Japan are based on the old Chinese lunar calendar, which was divided into 24 seasons. Many of the names of the 24 seasons have disappeared, but some, such as the first day of spring (risshun) and summer solstice (geshi), are still familiar to many people. The Japanese changes to the old calendar include various seasonal events to mark the changing seasons. These include the last day before spring (setsubun), the equinoxes (higan), the hottest days of summer (doyō), and the 88th night (hachiju-hachiya). Even today people hold special events on these days.